"This is a recipe from my seventh grade Home Economics class. These are the only butter tarts by husband will eat!" In a large bowl, beat the egg, then beat in brown sugar and salt. Stir in vanilla and lemon extract. Beat until light and bubbly, then stir in melted butter. Fold in raisins. Drop filling by spoonfuls into tart shells. Bake in preheated oven for 10 minutes. Reduce oven temperature to 350 degrees F (175 degrees C) and bake an additional 20 to 25 minutes, until filling is set and pastry is golden brown. Cut butter into flour to create flaky layers in pie crust and biscuits. Delicious! I omitted the lemon and vanilla extract, as well as the raisins. I put a pecan half on the tops, and baked at 400 for 10 minutes, and at 350 for 15 minutes and mine were perfect. These are scrumptious! I left out the lemon extract the second time I made them and we liked them even better. Also good with pecans substituted for the raisins! 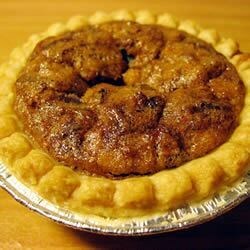 This one is close to tasting like traditional Canadian butter tarts, but does not include walnuts and is not runny enough in the center if the recipe is followed to the T.